Dana White’s “Tuesday Night Contender Series” enters its season finale tonight (Tues., Aug. 7, 2018) after seven episodes chock-full of entertainment and a healthy heap of fresh Octagon talent (get all caught up here). Leading the way this week is Greg Hardy, making his second appearance on the program against Tebaris Gordon. Light Heavyweight Kennedy Nzechukwu will also return after an uninspiring win in Season One, while the rest of the line up includes CFFC champ Joseph Lowry and LFA standout Bobby Moffett. Round one: Hardy comes out slugging. He backs Gordon to the cage and continues to throw until a right hook slips around Gordon’s guard and sends him to the mat. Round one: Early straight right by Lowry. Smith lands a leg kick. One minute in. Lowry lands another right hand over the top. Jabs upstairs. Another leg kick by Smith. 1-2 lands between the guard. Lowry goes low-high, eats a right hand. Two minutes in. Snapping jabs land for Smith. Lowry with a front kick to the body, wades in behind punches to shoot. Smith obliterates him with Browne elbows for his trouble. Round one: Bryant flicking out low kicks, eats a jab. Right hand by Bryant. Another nice jab by Nzechukwu, straight left. Bryant continues to pick at the leadleg. Bryant shoots under a head kick, stuffed, claims a back-of-the-head strike that Nzechukwu protests. One minute in. Bryant throwing more at the moment, not landing clean. Again Nzechukwu catches Bryant leaning with a head kick and this one drops him. Nzechukwu pounds him out with hammerfists. Round one: Early overhand from Moffett. He catches a kick and takes him down into half guard.Moffett looking to get his knee through. One minute in. He pulls Kilburn off the fence. Now he’s looking for an arm triangle, loses it. Still looking to get his knee through. Two minutes in. Moffett continuing to work on the arm triangle, but Kilburn maintains half guard. Good shots from Moffett. Still targeting the arm triangle. Two minutes to go. Full mount for Moffett. Short punches landing. Kilburn trying to buck without success. Moffett gets that arm triangle setup again, can’t complete it. One minute to go. Good elbows landing for him. 10-8 Moffett. Round two: Kilburn opens the round swinging, eats shots and gets taken down during a wheel kick attempt. Moffett on top in side control. Kilburn goes to his knees, fighting off the front headlock. Moffett looking for a d’arce. It looks good. Kilburn’s forced to tap. Round one: Trading punches in the center to start. Low kick from Coughran and a teep. Head kick attempt, left hook lands. Low kick. Counter right by Gilpin met by a left hook. One minute in. Coughran doubles up the right hand. Low kick. Gilpin with a right around the guard, eats another leg kick. Right hand knocks Gilpin back and Coughran follows up with body kicks. Coughran much, much busier so far. Gilpin lands a right hand. Coughran goes low-high with left hooks. Low kick again. Gilpin lands a body kick and eats a leg kick. Two minutes to go. Coughran continues punishing the lead leg, lands a right hand upstairs. Cross counters by Gilpin and he’s on the attack. Coughran blasts him with a combo in return. Double right by Coughran. One minute to go. They’re trading heat and it’s Coughran landing more. Overhand right by Gilpin, who catches a body kick but can’t use it. Coughran slings hooks and absorbs a body kick. He tries to spin and gets taken down, but scrambles up. 10-9 Coughran. Round two: Second round starts like the first, Coughran staying much busier. Back to the low kicks. Gilpin lands a pair of counter rights, Coughran connects with hooks. Hard left hook. Gilpin switching stance now. One minute in. 1-2 from Coughran, but Gilpin takes him down and denies an attempt to stand. Gilpin on top in guard. Looking to frame a d’arce choke. He gets Coughran to his side and puts in the squeeze. Coughran looks to sweep, but is forced to tap. Sherdog’s live DWTNCS coverage kicks off Tuesday at 8 p.m. ET. Reigning Legacy Fighting Alliance champion Ian Heinisch knocked out Justin Sumter with a volley of violent elbows in the first round of their middleweight clash on Season 2, Week 7 of Dana White’s Tuesday Night Contender Series at the UFC Training Center in Las Vegas. Sherdog’s live Dana White’s Tuesday Night Contender Series Season 2, Episode 7 coverage will begin at 8 p.m. ET. It is an amazing story. Nick Newell, born with a congenital defect that left him with just one arm, forged an improbable career for himself in mixed martial arts. And it’s been a career full of wins! In fact, his only loss was to Justin Gaethje in the WSOF. 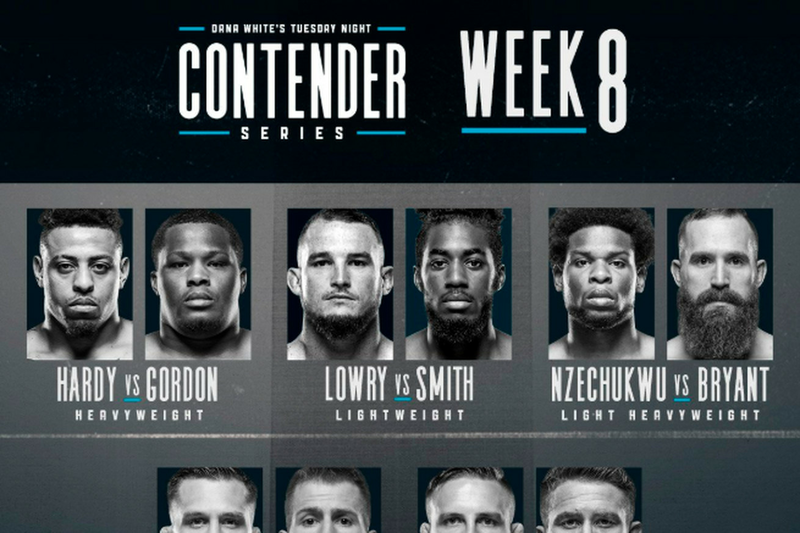 Of course Newell has been itching to get a shot in the Octagon, and everyone has been rooting for him, so Dana White relented and gave him a shot in the main event of tonight’s Tuesday Night Contender Series. His opponent was a rusty Team Alpha Male wrestling coach named Alex Munoz. And for three rounds, Munoz beat Newell up. I’ve watched Newell compete in the past, and was hoping he’d pull it off, because his tale is so compelling and heartwarming and would make for much better television than trotting CM Punk into the cage to die. But Munoz beaned him good in the face, and wrestled the hell out of him. For the briefest of moments, Newell threatened with the guillotine choke he’s famous for. And yet… and yet it wasn’t enough. Munoz took all three rounds, and took home the decision. There were some good fights on the card, and at the end of it all, when White was awarding contracts, Munoz was left out in the cold. But really, like when Kimbo Slice was on TUF, this particular episode was less about who was earning their berth in the Octagon and more about the noteworthy person in the cage. Too bad Newell couldn’t pull it off. The post Nick Newell Comes Up Short on Dana White’s Tuesday Night Contender Series appeared first on Caged Insider.